Watercolor on paper. Study for an oil painting. August 2013. 30 x 59 cm. or 11 3/4 x 22 1/4 inches. This entry was posted in Landscape Studies, Watercolors and tagged aquarelle of a farm on the Damsevaart, watercolor of a farm on the Damsevaart, watercolor study for a landscape painting on August 11, 2013 by ellentrezevant. Landscapes of a farm just on the outskirts of the village on Schiermonnikoog. Watercolor on paper. August 2012. 18 x 26 cm or 7 x 10 inches. SOLD. 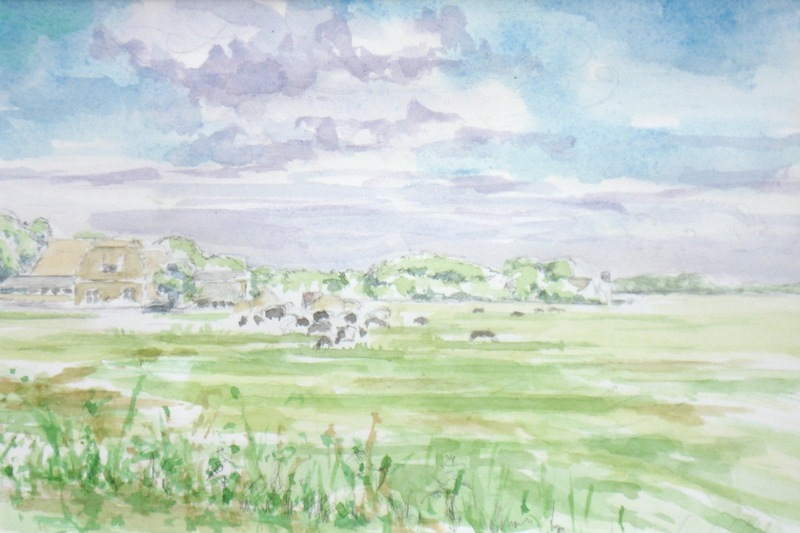 This entry was posted in Landscape Studies, Watercolors and tagged Schiermonnikoog watercolor, waterclolor landscape of a farm on Schiermonnikoog, watercolor of Schiermonnikoog on August 25, 2012 by ellentrezevant. Watercolor on paper. Study for an oil painting. August 2011. 30 x 59 cm. or 11 3/4 x 23 1/4 inches. This entry was posted in Landscape Studies, Watercolors and tagged aquarelle of Damme landscape, bend in the Dammevaart outside Bruges Belgium, watercolor study for a landscape painting on August 9, 2011 by ellentrezevant. Watercolor study in preparation for an oil painting. July 2011. 18 x 26 cm or 7 x 10 inches. This entry was posted in Landscape Studies, Watercolors and tagged Aquarelle of the Dammevaart, watercolor of the Dammevaart in Bruges Belgium, watercolor study of the Dammevaart for an oil painting on July 15, 2011 by ellentrezevant. This entry was posted in Landscape Studies, Watercolors and tagged watercolor of the Vaartdijk in Bruges Belgium, watercolor study for a landscape painting, watercolor study for an oil painting on July 15, 2011 by ellentrezevant. Watercolor on paper. Study for an oil painting. July 2009. 30 x 59 cm. or 11.8 x 22 1/4 inches. This entry was posted in Landscape Studies, Watercolors and tagged watercolor of the Kruispoorte Bruges Belgium, watercolor study for a landscape painting on July 15, 2009 by ellentrezevant. Watercolor study of the Langerei from the northern end. Mid morning light. Study for an oil painting. July 2006. 23 x 30.5 cm or 9 x 12 inches. This entry was posted in Landscape Studies, Watercolors and tagged watercolor of Bruges Belgium, watercolor study for a landscape painting, watercolor study for an oil painting on July 20, 2006 by ellentrezevant.